not many people will have harboured the desire to appear identical to Newcastle United footballer Leon Best. Nothing against Best of course, but let's be honest, he's not what you would call a household name - although if he continues to score goals like his winner against QPR on Saturday, maybe that will change. But this girl not only wants to look like Best, her 'favourite soccer player eva', but she'll show you how to as well. Just in case, you know, you ever wanted to. Using a variety of cosmetics like hair lotion, eyeshadow and eyeliner, she talks you through her creepy transformation from a regular looking girl through to a carbon copy of the striker. The Mail has embedded the video from YouTube at the end. What it hasn't done, however, is read any of the comments under it (or, it seems, any of the comments under its own article). The vast majority are pointing out this isn't really about Leon Best at all. This version of the video is a spoof. 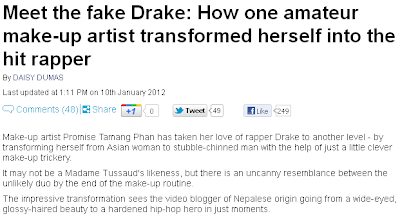 The 'girl' in question is Promise Phan, who has posted lots of videos on YouTube of her using make-up to make herself look like other people - Angelina Jolie, Justin Bieber and Kim Kardashian among them. Leon Best would certainly seem an unlikely addition to that list. 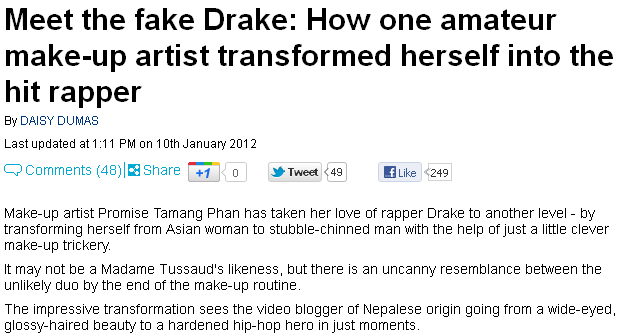 Indeed, what Promise Phan was actually doing was transforming into a rapper called Drake. If Sharma hadn't read the Mail, it is possible he had read Mirror Football's 3pm Extra, which highlighted the video an hour or so before his article was published. It appears the Mirror hadn't realised it was a joke, either. All because you couldn't spare some common sense to do a background check on where this video had come from. Funny. That journalists obviously should have made a phone-call, but to be fair, it is getting easier to trick people. Example: Firefox offers a simple tool meant to make it easier for children to understand HTML or something. It lets you edit any part of a website - change the text or whatever. You're only changing a version you're seeing through that tool of course, but if you were to make changes to a news story / any other text, and take a picture of it, you wouldn't be able to tell from the screenshot that it was fake. Could probably stir up plenty of outrage on the internet before anyone bothered to check the website.